As German voters go to the polls on Sunday, unemployment will be a key issue. Despite tough labour market reforms, the number of unemployed has risen to 5m. And Germany's jobless are getting despondent. 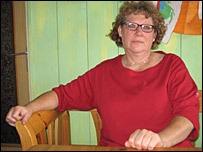 For 34 years she worked in the same factory, but she lost her job in December 2002. Since then she has not had steady work, despite applying for jobs as far away as Austria. Her husband Kurt, who had worked there for 23 years, lost his job the year before. They live in Neustadt bei Coburg in Bavaria, and with unemployment running at 15% there are very few jobs going. Now, new labour market reforms are beginning to bite. At the moment, she gets 900 euro (£610, $1,100) in benefits a month, her husband 208 euro. Since the money didn't cover the bills, he sold part of his record collection on eBay. But when the benefits office discovered their extra income, it demanded repayment of half-a-year's worth of welfare payments. New laws - the so-called Hartz IV reforms - will soon cut her payments to just a few hundred euro. They can barely afford the two bedroom flat where they lived for 22 years, and may have to move out shortly. "There are days when all this feels just like one big nightmare," says the 51-year-old Mrs Wittmann. 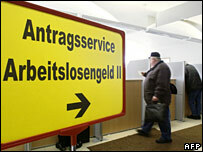 Germany recorded 5.2m people without a job earlier this year - a post-war record. The numbers have fallen back below the five million mark since, and are even lower using the standardised European way of measuring unemployment. But the impact has been devastating, not just on those without a job, but for the wider economy as well. "High unemployment stops consumers from spending, and reduces the overall buying power, and the result is even less economic growth," says Dr Rainer Hecker, who runs Loewe, a German consumer electronics firm. Unemployment has been the big topic of this election campaign, and all parties have promised to solve the problem. In reality though, none of them has offered any new solutions. The longer the problem persists, the worse the situation gets. Nearly 40% of the unemployed - some 1.8m - have been out of a job for more than a year. Anybody who has been unemployed that long finds it difficult to get work again. Andreas Juraschek, 43, had been willing to do all kinds of jobs - shop assistant, security guard, trucker, selling adverts, varnishing furniture - but all his employers were struggling firms who could not afford to keep him on. Out of a job for two years, he has applied in vain for 50 or 60 jobs. New labour laws have forced him to work for the local council for 1.50 euro an hour. 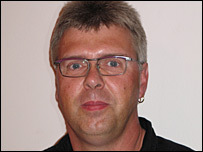 Hans-Juergen Schneider, 49, is an engineer with project management experience. First out of a job in 2000, he tried to run his own hotel in Eastern Germany. The venture quickly failed and for nearly two years he has been looking for work. Last year he wrote 286 job applications, all without success. Tanya Diettmar is 22 years old and a trained secretary with language skills. During the past year she applied for 120 jobs, and although she got close to a few, she was never hired. Before the Berlin Wall came down, West Germany had an elaborate programme to deal with such cases. The government employment agency paid for retraining courses to match skills with demand. But after unification in 1991, the system collapsed under the sheer weight of numbers, as thousands of East Germans lost their jobs. Today nearly 35% of Germany's long-term unemployed have hardly any formal qualifications. "The quality of the job applicants I see is getting worse and worse," says Rainer Bosecker, head of personnel at Saint-Gobain Ceramics in Roedental, which is currently hiring. "Their motivation, their knowledge and their preparation are just not up to scratch," he complains. Mrs Wittmann, for example, received only her former employer's in-house training, but the job centre refuses to send her on any courses, she says. Living in Jena, Eastern Germany, 52-year-old Kaethe Winter had more luck. The job centre paid for a three-year training course to prepare her for work in the hospitality industry, but prospective employers told her she was "too old". Two English courses and a special training programme for unemployed academics later, she is in and out of short-term jobs and dozens of applications have got her nowhere. To get Germany out of the economic hole, Chancellor Gerhard Schroeder social democratic government has enacted labour reforms like none before. It's easier to hire and fire. It's more tax-efficient to set up a small firm. Unemployment and welfare benefits have been cut and rolled into one, to force people to leave what the Germans call the "soziale Haengematte", the welfare hammock. People who have been without a job for a long time are offered poorly-paid "one-euro jobs" in the public sector, to help them get used to regular work again. The employment offices have been restructured to provide more localised services. So far, though, these and other reforms have had little impact, and everybody is frustrated - including the employers. "I used to have a single point of contact at the job centre," says Saint-Gobain's Mr Bosecker, "but since the reforms I have to talk to five different people." "All the reforms have done is to change the way unemployment is managed, not to make it go away," believes Dr Hecker at Loewe. Many economists praise the reforms. They believe the tougher laws have persuaded both workers and trade unions to be more flexible. Indeed, across the country trade unions have accepted lower wages and more flexible working hours. But jobless people like Mr Schneider scoff: "We're now doing the reforms introduced in the Netherlands a decade ago, and look at how much trouble their economy is in." And many people set limits to how flexible they want to be. When Saint-Gobain closed its factory in Erlangen and moved all 75 jobs to its main plant in nearby Roedental - a bit over an hour's drive away - only seven or eight of the workforce were prepared to follow their jobs. 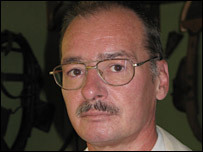 "People rather work in lower paid, lower qualified jobs than move a hundred kilometres away," says Mr Bosecker. Even sharp cuts in benefits can't persuade everybody to take up opportunities. 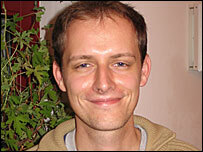 Stefan Otto, a 44-year-old engineer and software developer, has been out of a job since April 2003. He has had offers to work on software projects. "It would have been a couple of months here and there, but for such brief stints I'd have to fill in so many forms, it's not really worth the effort," he says. Many of the jobless say that being unemployed makes you feel unwanted and useless. Some have strategies to cope with the lack of focus in their lives. Others just give up. But they all want to know why they can't get out of their situation. Technology is one scapegoat. "The higher the productivity the fewer workers we need," says Kaethe Winter. Andreas Juraschek believes that companies have become too greedy: "A 10% profit margin won't do anymore, they want 20% or 25%." "Where is the state to organise our lives?" asks Hans-Juergen Schneider, who grew up in East Germany under communism. He adds: "There is not a single problem in the history of mankind that was solved by capitalism or the market economy". And, his face red with anger, he adds: "Human beings have been downgraded to an economic factor." The unemployment problem is set to become a time bomb. "We're gambling with Germany's future," says Frank Brueckner, who runs a plumbing and heating business near Coburg. "So many young people can't get an apprenticeship that in 10 years the whole country won't have enough skilled workers." And for those out of work it gets ever more difficult to get a job again, says Leonhard Fehn, who runs motivational courses for the long-term unemployed in Weidhausen. In 14 days he helps them to rebuild their confidence, recognise their strengths and prepare for job interviews. "I used to get 60-70% of the participants back into work, but our region recently lost 5,000 jobs in just 18 months, and since then it's been really difficult," says Mr Fehn. He has set up a support network, the "club of the jobseekers". They help each other to stay motivated, but the good news stories are all too rare. One club member, 28-year-old carpenter Christian Marterer, was unemployed for two-and-a-half years. A few weeks ago he got a job at Saint-Gobain's ceramics factory in Roedental. The company received 3,500 applications for 170 posts. "When I got the job offer," says Mr Marterer, "it felt like winning the lottery." This is the fifth of our reports from Germany; in the run-up to the election we are looking at the country's economy, how its companies are trying to beat the slump, the hedge funds buying up German assets and how unions and employers are jointly reshaping German industry.